Why self build? Why custom build? Exhibitions, seminars, conferences & visits. The government Homes and Communities Agency have recently announced it would be making up to £30m of funding available to provide short-term project finance to help unlock group custom build – or self-build – schemes. This is intended to be a ‘pump priming’ revolving fund and details can be found at Custom Build . The conventional method here is for a lender to tie a mortgage back to an individual borrower (rather than a group) and the lender wants to be able to sell a mortgaged property without any complications in the case of a default on the loan. The reasons that a community of people might want to build collectively (such as having some of the facilities owned in common) is the very thing that the individual type mortgage system has difficulty handling. The community may have conditions for membership and this could make it more difficult for the lender to sell the property in case of default on the mortgage. It may be that the ownership of a property within a community goes hand in hand with ownership of a shared part of the the community assets so that they both have to be sold at the same time in case of default. This then becomes even more complicated. Not only does the bank/building society have to find a purchaser who is acceptable to the community but it also has to be someone with the cash to buy into the shared assets. In some countries the equivalent of housing associations have come to the rescue to provide finance (and in the past that has happened here to a limited extent, along with some local authority involvement). However housing associations are now mostly dealing with more urgent housing need. Other models are available and probably the simplest for a financial lender to deal with is if the community forms a limited company with its members as shareholders and acts like a normal commercial developer (but for itself). It then borrows money from a bank or building society and makes self build available to its members on a leasehold basis. The Nationwide Foundation has funding available for work that strengthens the infrastructure of the community-led housing sector. The Backing Community-Led Housing programme is open to applications for grant or programme-related investment funding, which will strengthen, support and champion the growth of community-led housing, so that more people in need will benefit. Triodos bank have a policy of lending to community groups and groups who are involved with environmental change. 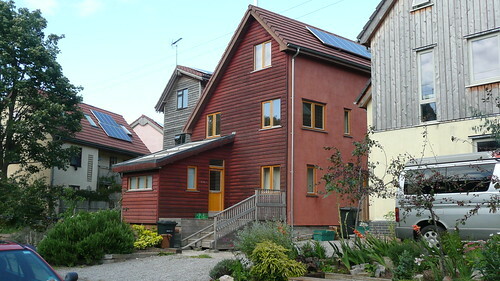 They have been involved with cohousing schemes in the past and actively support it. The Ecology Building Society lend to housing coops and also to developers involved in small scale ecological housing. Unity Trust is a specialist bank for social enterprises. As a part of our energyshare community, you’ll know we are partnered with the UK’s leading crowdfunding platform, Crowdfunder. Following on from our success with EnergyFund Cornwall and the M&S Energy Community Energy Fund, both of which were powered by Crowdfunder, we look forward to funding even more energy projects across the UK together. We believe that crowdfunding will be an essential part of the funding mix for renewable energy projects in a post subsidy era and as an energyshare community member we want to ensure you are aware of an exciting opportunity. Inform and engage the public through workshops, street stalls, stunts and more. A group of us in the Tottenham area of London are interested in buying a large site with buildings that could either be converted or replaced. We would like some of the properties to be available for sale to members of the group and some to be for rent from a local housing co-op.Do you know of any schemes in the UK who have anything approaching such a model as we would be very interested in visiting and chatting to someone or some people who have attempted something like this before, preferably in an urban setting – many thanks for your help. What is 12 + 13 ?